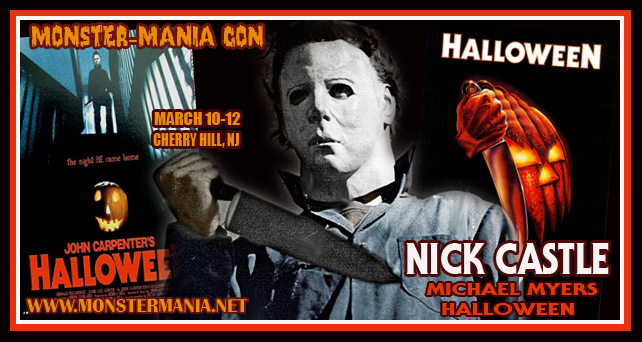 Convention season is nearly upon us, and while we’re getting ready to cover all the killer festivities coming up at Mad Monster Party 2017 in nearby South Carolina, there is news from our friends up north that The Shape himself, Nick Castle is coming to Monster-Mania 36 in March, along with Halloween franchise composer Alan Howarth, and many more icons of horror. Nick Castle of course played “The Shape” (otherwise known as Michael Myers) in most scenes featuring the masked killer in John Carpenter’s orignal 1978 Halloween, but you may have forgotten that Castle also co-wrote Escape from New York with Carpenter, and he later directed a number of his own films, including the classic The Last Starfighter. Alan Howarth collaborated with Carpenter on the soundtracks for Halloween II and III, as well as They Live, Christine, Escape From New York, and others, and took over as composer for Halloween parts 4 through 6. Howarth will also perform live in concert on Saturday night, March 11 as part of the convention. Additional guest already announced for the event also include The Shining stars Danny Lloyd and Lisa and Luis Burns, as well as Pinhead himself Doug Bradley (Hellraiser), Kristy Swanson (Buffy the Vampire Slayer), Barbara Crampton (Re-Animator), the kids from Stranger Things, and even John Cusak (Identity, 1408, The Raven), among others. There will also be a reunion of several cast members from John Carpenter’s The Thing, including Wilford Brimley, making his first ever convention appearance. Monster-Mania Con 36 is happening March 10-12 in Cherry Hill, New Jersey. You can get tickets here.